I am feeling incredibly tired tonight, but extremely satisfied and more than a little bit emotional about all the things that have been going on this weekend. We have just completed our most successful open weekend for some considerable time. 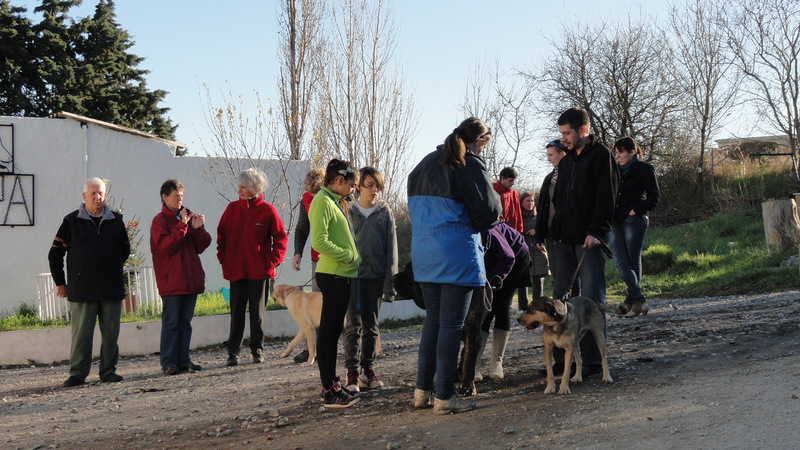 The skies were blue, the refuge was packed with people walking dogs, delivering presents and blankets, standing around in the sunshine enjoying a glass or two of mulled wine and better still, adopting or reserving dogs and cats! At the same time we had volunteers at Jardiland and at the Christmas market in Cavanac. A huge team working in harmony all towards the same goal; to improve things for our protégés at the SPA. I cannot count the number of people who paid us compliments on the organisation and the dedication of the staff and volunteers. It was like a well-oiled machine, with people helping out where they were needed. I was incredibly proud of everyone. What a marvellous atmosphere. 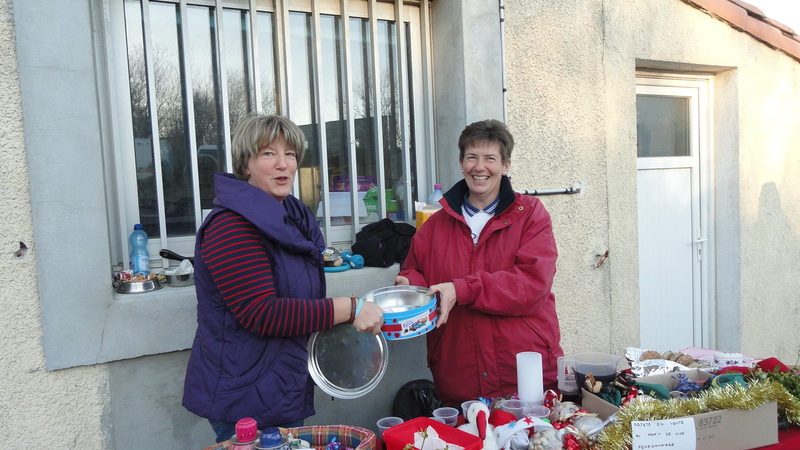 Christmas cheer abounded it was not only money that was raised. Our morale took a huge boost too. I suspect I am not the only volunteer who has a huge smile on their face tonight. So, I know you are desperate to know; who left? Well, first to go was lovely Amadeus. I am surprised he stayed as long as he did. He is going to be a very happy dog and we will have lots of news, as he has gone to the family of one of our volunteers, Isabelle. The only other actual departure was that of lovely Yoga, but we had no fewer than four further reservations. Usually I do not list these, so as not to tempt fate. However one of them I just need to tell you about, as in many ways it illustrates so well what we have been busy doing recently. Last weekend at la Cite we had the folder with photos of all the dogs at the refuge. A family showed a lot of interest in one of our dogs, Keops, who has been at the refuge since December 26th 2011. They promised to come and see him at the open weekend, and true to their word, they came along today. 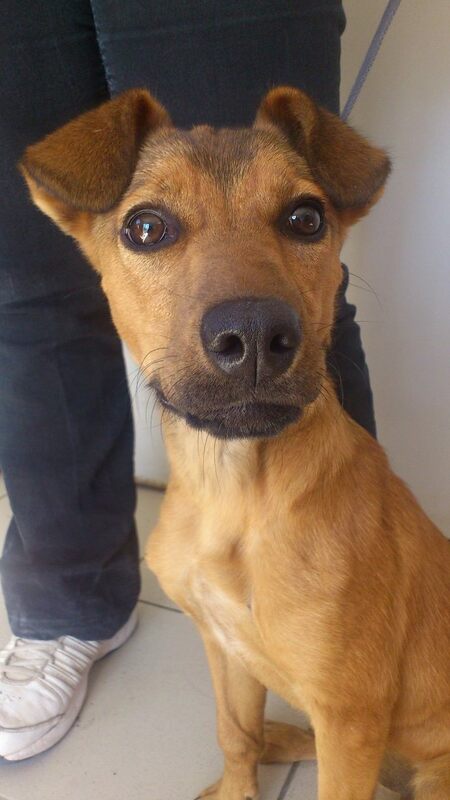 The attraction between the dog and the family was immediate and instant, and after a walk together, Keops is now officially reserved. Had we not been at la Cite, this family may never have come to the refuge. 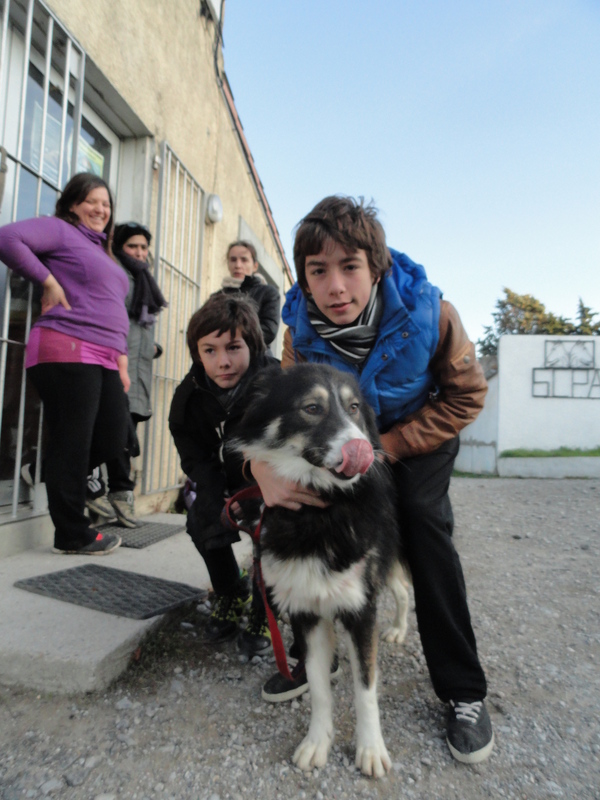 Equally, several people at the market in Cavanac today are now aware of the wonderful dogs that we have at the SPA. It is a case of spreading the word and for this you need exactly what we have; willing hands who love animals and share a common purpose. Ten dogs and four cats have left as the result of the open weekend alone, and the funds raised mean that, amongst other things, more kennels are on the way. Thank you to everyone who supported us in so many ways; but especially to the wonderful SPA team. And that is what we are, a team. No better illustration exists than what we have achieved together these past weeks. I am going to sign off, I think I have some dust in my eye! Team Puivert with their hands in the cookie jar! As you know, today was day one of the Christmas for Animals and despite a dull start to the day weather wise, by 14H20 we had already had our first adoption and a huge number of donations! The day continued in the same vein pretty much till closing time. We had visits from lots of our ex-“inmates” which was fabulous. The doggy-treat stall was a huge hit and the Christmas tree is looking pretty full, with loads more baubles decorating its branches. There are several people and groups I would like to thank. As ever I am scared to forget someone, but I simply must mention the Country Dance group from the MJC, who came with two carloads of food, and also Trebes Dog Sport Club, who were also incredibly generous. Sadly I do not have a photo of them, as they insisted that I go in front of the lens, but if I get hold of one I will add it later on, as they deserve more than just a brief mention in dispatches! 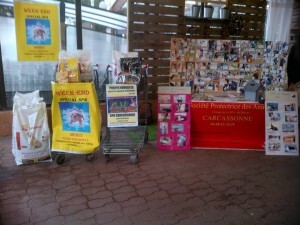 There was also a collection of dog food at Jardiland, and again the volunteers were present, showing off our dogs and promoting the SPA. I passed by on the way back from the refuge and the trolleys had filled up nicely! Indy, Chuppa, Lili, Plume,Chups, and Springbock! Yes, six more dogs are in the warm, and there were a couple of reservations, too! We are delighted, and we are hoping for more good news tomorrow. Thank you to everyone who came along to support us. 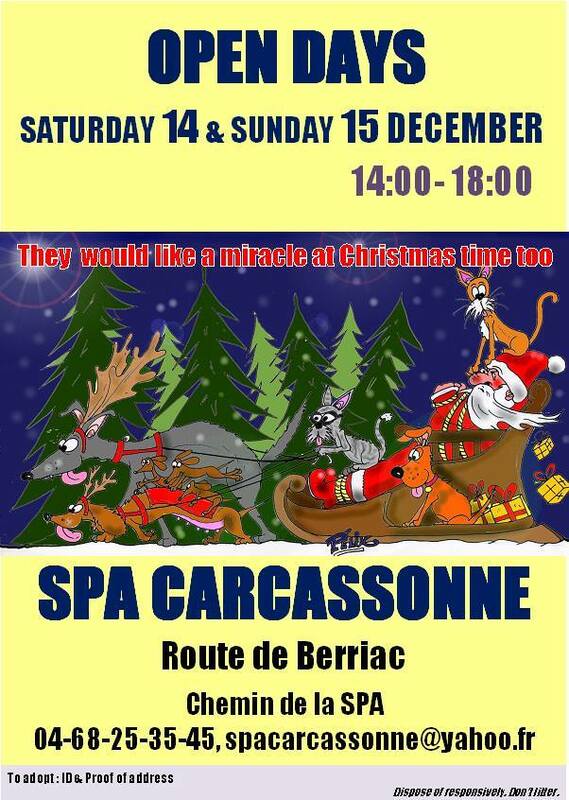 If you came to the refuge today and want to do something different tomorrow, why not go to the Christmas market at Cavanac, where you will find yet more volunteers and more ways to support the SPA. No Puppies for Polka, thank you! Hardly a single visitor at the refuge today yet again. I wonder if everyone is planning on coming at the weekend for the open days! The news that the Narbonne refuge is closed until further notice “for health and hygiene reasons” is clearly terrible for them, and they have our sympathy, but please don’t think that we have a similar problem. We are up and running and looking forward to lots of adoptions this weekend! 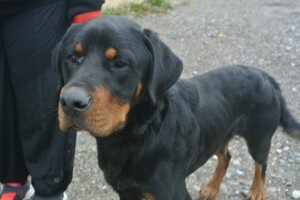 One dog was reclaimed by his owner, a Rottweiler whose owner did not have the correct paperwork. That has been rectified now, but here is a hint; if you do not have the right paperwork for you categorised dogs (ie rotties or staffies), do try not to draw attention to yourself by walking them without muzzles etc. You are just asking for trouble, especially as with elections looming, the police (in Carcassonne at least) have been told to check up on such things. Two chasse dogs arrived; they are not identified, so whether or not they are claimed probably depends on how good they are at the hunt. We shall see. 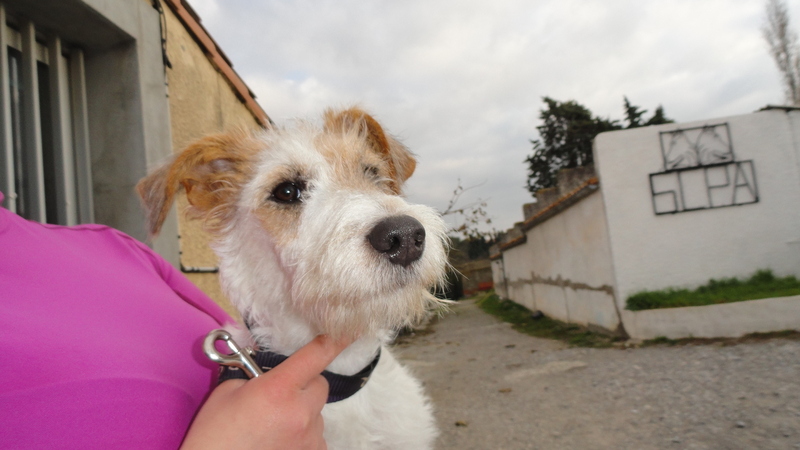 Finally we had the return of Polka, a tiny fox terrier, who was adopted as a puppy. 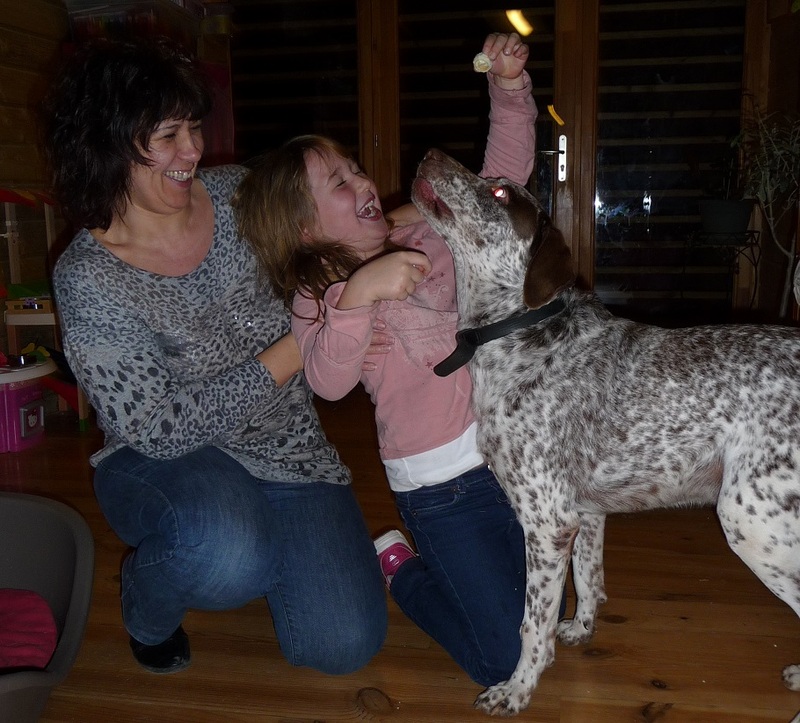 Her sister, Salsa, was homed thanks to Doglinks, but Polka had no such luck. Her owner gave her away so that she could be used to reproduce, and we had to wade in. But wade in we did; all our females leave sterilised and female puppies have to be sterilised at the age of 6 months. We are firmly against reproduction, as are most people who work or volunteer in refuges. There are already too many dogs out there! Finally we had news of Calvin. He is doing amazingly well, by all accounts. 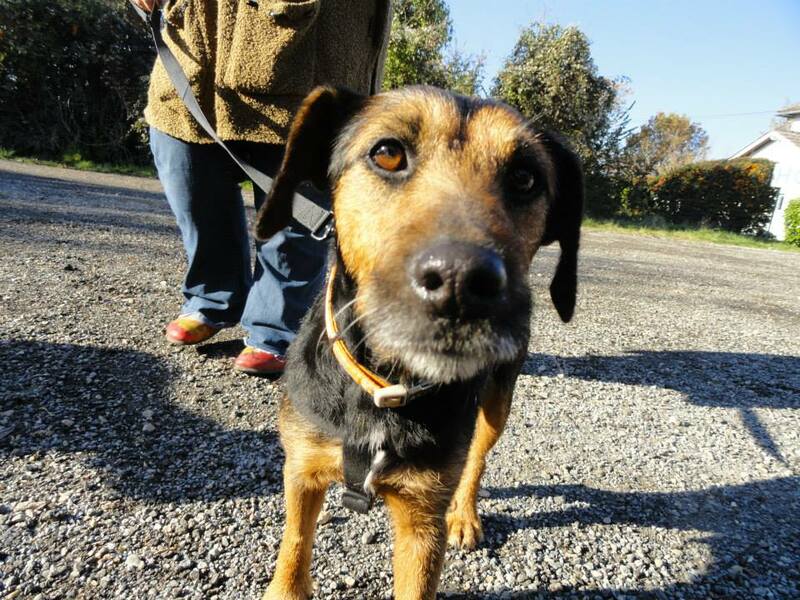 For a dog who spent two years at the refuge he has settled incredibly quickly. He wakes up the little girl with kisses, sleeps in his basket outside her door and has made friends with all the neighbours and their dogs. It is like his life was just on hold for two years, and he has just got back into the routine he had before. On the one hand, what a waste of two years, but on the other hand, how lovely that this family were willing to give him this second chance. Benedicte was going to see Calvin today and take her camera, but so far she has not sent me any pictures. 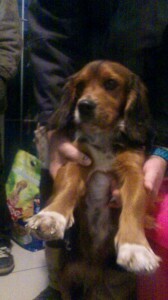 If she does so later on I will edit this post, so pop back later to see this lovely boy in his new home! Polka is back, but before she became a puppy factory! And better late than never CALVIN! Getting ready for another busy weekend! Yet again the refuge was very quiet and apart from one dog finding his owner yesterday, there is nothing to report. However don’t think that the employees have been hanging round kicking their heels! Far from it! As well as the usual afternoon activities of cleaning out the cages and rotating the dogs in the parks to give them a run around, giving medicine and a second feed to those dogs and cats who need extra care, the employees and volunteers are getting ready for another busy weekend! This weekend is the nationwide Christmas for Animals open weekend at the SPA. So yesterday and today posters were made and a team of volunteers and employees went out to “decorate” the roundabouts in an attempt to attract people who do not have internet. 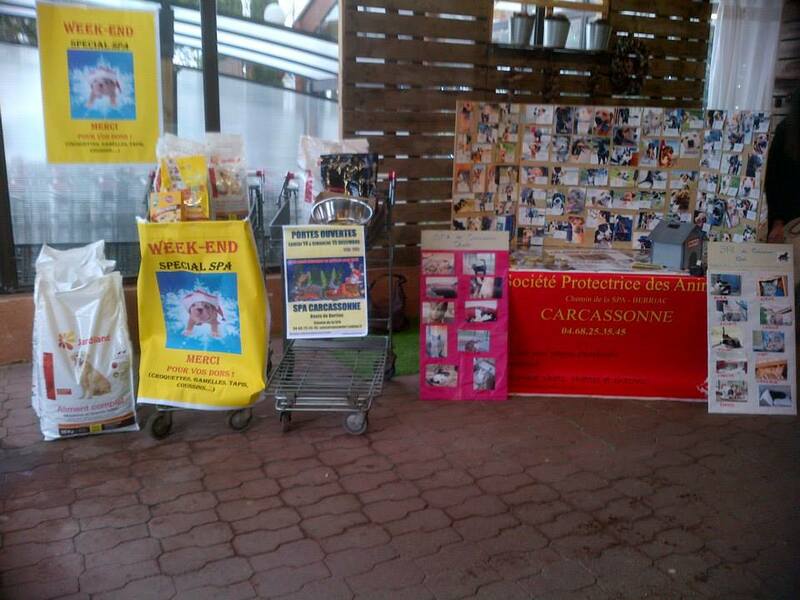 At the same time as the open weekend, we are doing a collection of dog and cat food at Jardiland, a garden centre which is located close to the refuge. 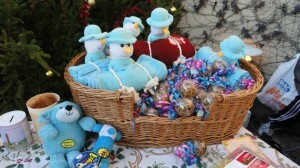 Our previous collections there have been an enormous success and we are hoping that this time will not be an exception. The display board with pictures of the dogs is being brought up to date and “Team Cat” is hard at work preparing a board for the kitties too! Not only that, we will also be present at the Christmas market in Cavanac on Sunday. 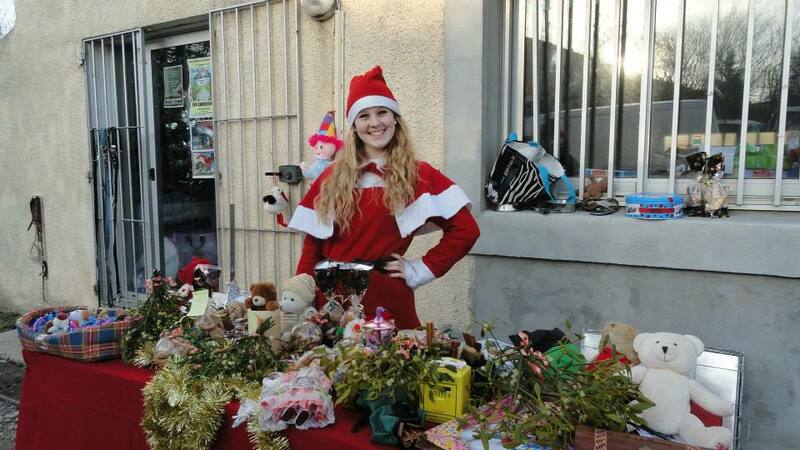 Volunteers Laurene and Isabelle will be selling Christmas gifts and treats for dogs and humans alike. So whether you want to spend your weekend at a garden centre, at the SPA or at a Christmas market, there is something for everyone! So another busy but exciting weekend beckons. As I have said before, fundraising is wonderful, but adoptions are needed too. 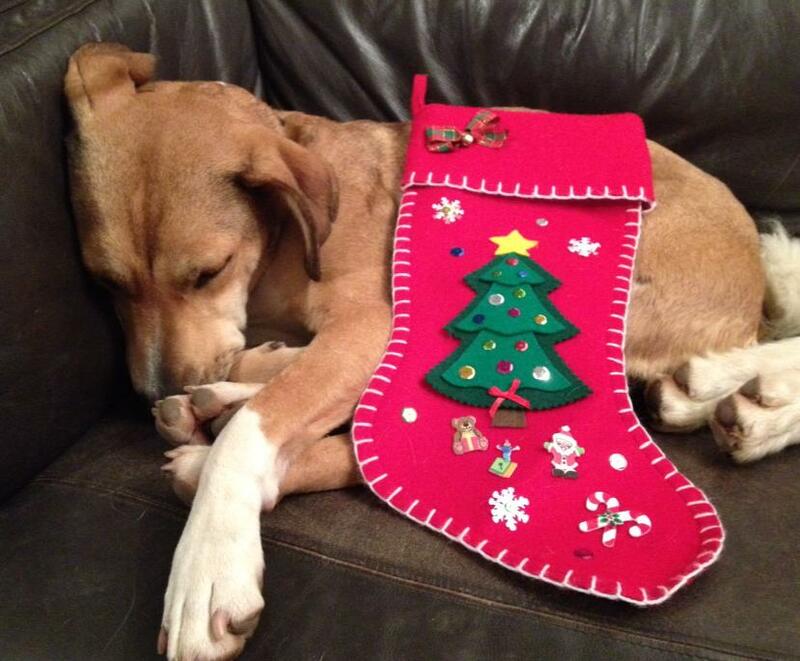 I am hoping that every dog and cat can have a home for Christmas. And I know of one girl who is ready and waiting for Santa! How many other refuges have teams able to work on all these fronts at once? We are truly blessed. So in advance, thanks to everyone for your time and devotion. My husband calls me “the mad dog lady”; it is good to know I am not alone! Calie waiting for Santa. But has she been naughty or nice? Please don’t forget our open weekend. You could make a dog as happy as Calie! 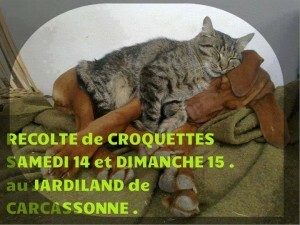 Adopters needed. 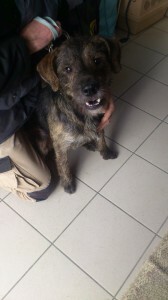 And if you are in the UK we have a dog-transport possibility! As you know, we have had two enormously successful fundraising events this weekend. 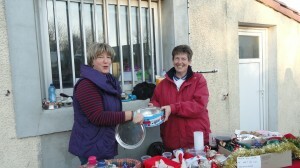 The event at Puivert raised some 550 euros for the SPA (the same amount going to Twilight, of course). 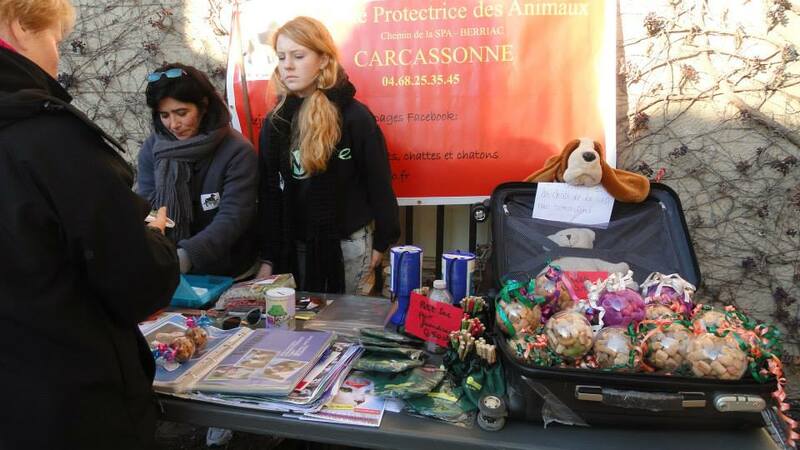 And the stand at La Cite raised almost 750 euros, which is an incredible total considering that all we had on offer were treat-filled baubles and other gifts for animals. It must have been our charm alone that did the trick, so thanks to Veronique and Val, who organised the SPA’s participation as well as all the lovely volunteers who helped out. At the refuge, however, things remain bleak. 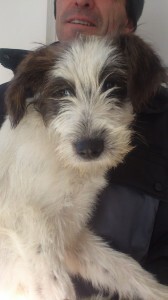 On Saturday there was not a single visitor, apart from a couple of people who reserved puppies. Three of last week’s arrivals (the three musketeers) have been reserved, as has Chuppa, but our other puppies are just being ignored. Khensit is growing up behind bars, as is Lili. And the other beauceron cross, Chups, has had no interest shown in him at all, despite the fact that he is just a baby. As I have said to several people recently, fundraising is wonderful, and we can definitely use the money to improve the lives of our dogs and cats. Thank you to everyone who has contributed to the Paypal fund or at our fundraising events. But if we have no adoptions, the animals are doomed. Our walls are not elastic and we really are at capacity. Dogs and cats arrive every day, and we have no option other than to take them, as we act as the pound for the Carcassonne Agglo (which is now 73 villages strong). I just don’t know what we can do. As recent events have shown, we have a highly motivated team of volunteers who give everything they have to help the refuge. Now we need adoptions! 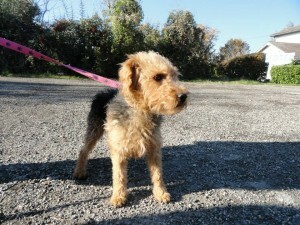 We have our open weekend approaching; but as last year, this coincides with a sale of puppies in Carcassonne. Great, eh? Many of these puppies will end up at the SPA in any case. It is just so dispiriting. And how about our own pups? Why aren’t they good enough? Okay, they may not be pure bred, but cross-breeds are far more robust and you know you will not be encouraging the horrors of puppy farming. However in the middle of it all, there is some good news; Associaton Orfee have just informed us of the adoption of Griffi. 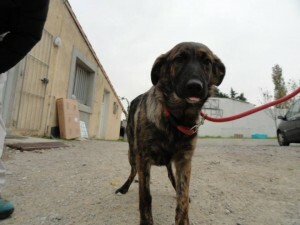 She and her brother, who were inseparable at the SPA, have learned to be less inter-dependent, and as they are both with other dogs they are now happy to live apart. Griffi especially so, as she now has a permanent family! WE HAVE A VEHICLE DRIVING OVER TO THE UK IN MID JANUARY, SO IF YOU WOULD LIKE ONE (OR TWO) OF OUR DOGS BUT ARE WORRIED ABOUT HOW TO GET THEM, WE HAVE SOLUTION! ALL WE NEED IS 3 WEEKS’ NOTICE FOR THE RABIES VACCINATION! Khensit- I am growing up behind bars. Lili – Me too and I don’t like it! Chups- Why does no one want me? 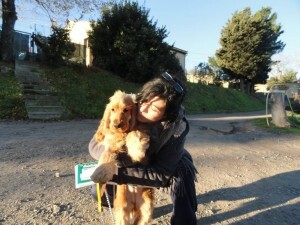 Griffi (on the right) – I am lucky. I have a family and a new friend! There are two fundraising events taking place this weekend. By the time you read this, one and a half will be over, but I will tell you later how you can join in with the half that is happening tomorrow! 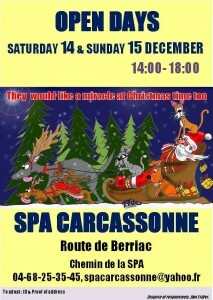 And of course there is always next weekend, which is Christmas for the Animals at the SPA. But let me start at the beginning. 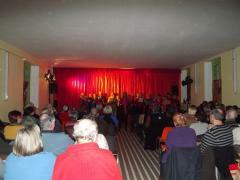 Last night was the long-awaited fundraiser in Puivert. 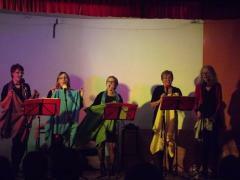 Thanks to the vagaries of my GPS (not Sharon’s this time), we arrived a bit late, but directly into a fabulous concert given by the Puivert choir. A mixture of Christmas carols and standards, all beautifully sung. The festivities had officially begun! After a break for mulled wine and mince pies, it was off again with the Old Spice Girls, who sang in both French and English and were wonderfully entertaining and talented. There was a raffle and of course the silent auction and a couple of craft stores, as well as a display showing some of the many dogs and cats at the refuge. We hope that some adoptions may result, but the goal of the evening was to raise funds for the SPA and Twilight, and the raffle alone gained 330 euros! I must say enormous thanks to the organising team. As usual I am afraid to leave someone out, but I have to mention Deb and Belinda who are probably both having a quiet night in! I don’t know the final fundraising total yet, as the silent auction bids still have to be added up, but I will let you know as soon as possible. The today the SPA has been at the Cite where we have been taking part in “the Magic of Christmas” inside the theatre. 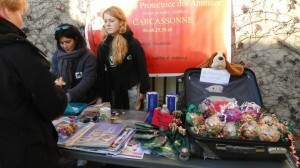 We were kindly given a stand, thanks to Veronique and Val, and several other volunteers showed up with and without dogs to spread the word about the SPA and the importance of not buying puppies at Christmas without adequate time for reflection. We will be at La Cite again tomorrow, so if you missed us today, please come and say hi. 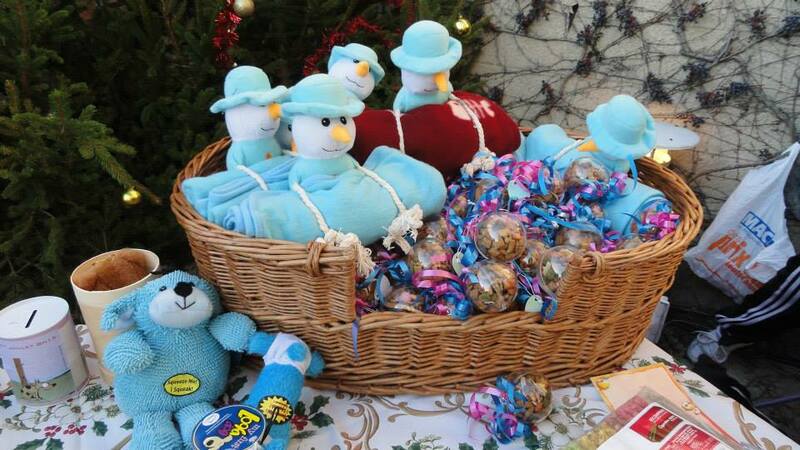 There are some lovely craft stalls where you can but gifts, but don’t forget to put a little something into the donation box for the SPA….We have presents for the dog or cat in your life as well! At the refuge it was business as usual. Three more pups arrived yesterday, plus and adult who is identified but whose owners gave her away a year ago but can’t remember who to. I don’t have today’s news yet, but I want to post this blog so I can go and thaw out my feet, like the other girls who were at the Cite! Gifts for the dog or cat in your life! My lovely Nero, star of the show and photographed by many a Spanish tourist! Today has been one of the worst ever. I know I seem to be saying that a lot, and I mean it every time, but today was even worse. 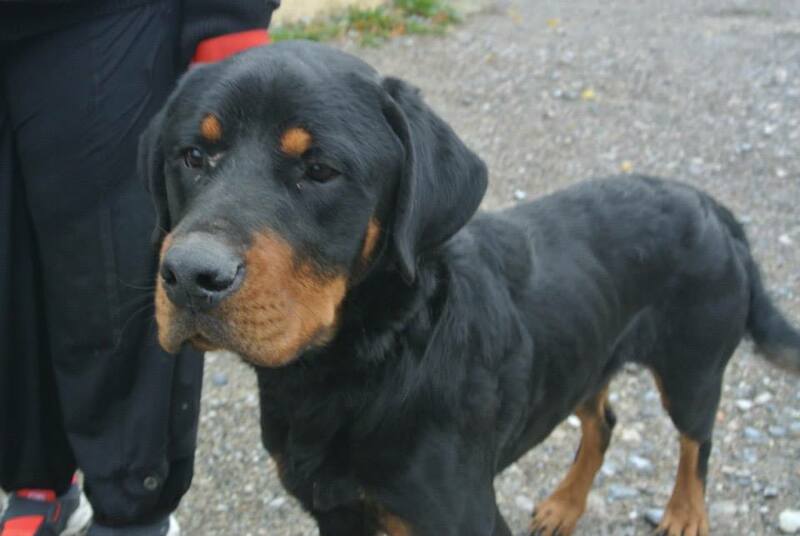 Yesterday the vet informed us that Arnak, the lovely Rottweiler who arrived at the refuge recently had inoperable cancer. He was starting to suffer greatly as his lungs were filling up with fluid, and draining them would not resolve the problem for more than a couple of days. So this morning it was with great sadness that Carole and Melissa took him to the vet to comfort him in his last minutes. 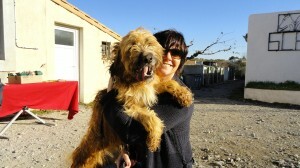 This dog had essentially been abandoned by his owner and was a stray until being brought to the refuge. 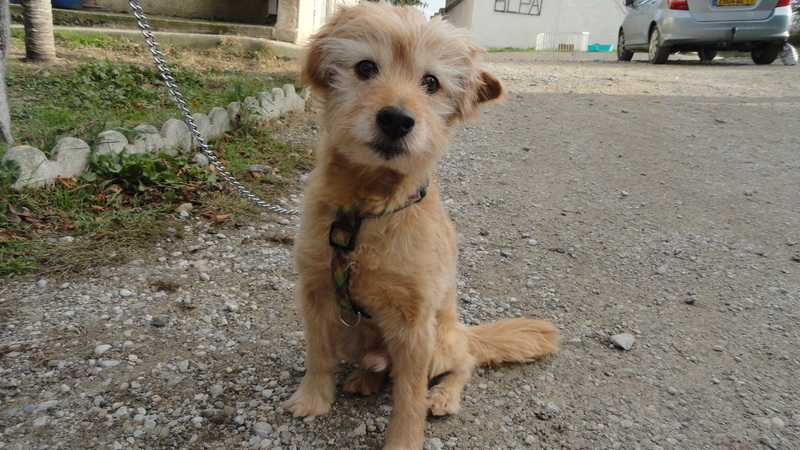 We were within our rights to refuse his entry as he came from a village that has refused to pay anything towards the SPA for the past 4 years, but their mayor took the dog to another village which does have an agreement with us. Oh hail the moral courage of our elected representatives. As soon as we saw Arnak we all fell in love, as he lay on the floor to have his tummy tickled. And he was so happy to be in the warm after so long on the road. So despite our resolve to return him to the irresponsible maire in question, we took him in showed him what love is like. Sadly his time on earth was cut horribly short. At the vets Carole and Melissa were given more bad news. On Tuesday when the refuge was open someone threw two puppies into the SPA exterior box (which is used by the police for emergencies when we are shut). We immediately realised that the dogs were ill, but despite rushing them to the vet straight away, the little boy died this morning of parvovirus. Of course the owners should have taken the dogs to the vet, but that would have involved paying. Much better to just throw them at the SPA, which is just a dustbin, in essence. Once again I am at about rock bottom and not sure I can carry on. I am just off to the fundraiser at Puivert, maybe I will be a bit cheerier when I return! It must be said that money is lovely, but no amount of money would have saved either of these two dogs, so what we can achieve will always be limited. Tomorrow we will be at the Craft Fayre at the Cite, by the way. We were there last night for the opening ceremony and there are some amazing stalls. As far as the SPA is concerned, we will be showing some of our dogs, as well as selling our treat filled baubles and just generally trying to raise awareness about the plight of animals in this sad, cruel world of ours. Arnak – what a sad way to end his life. I curse his owners. 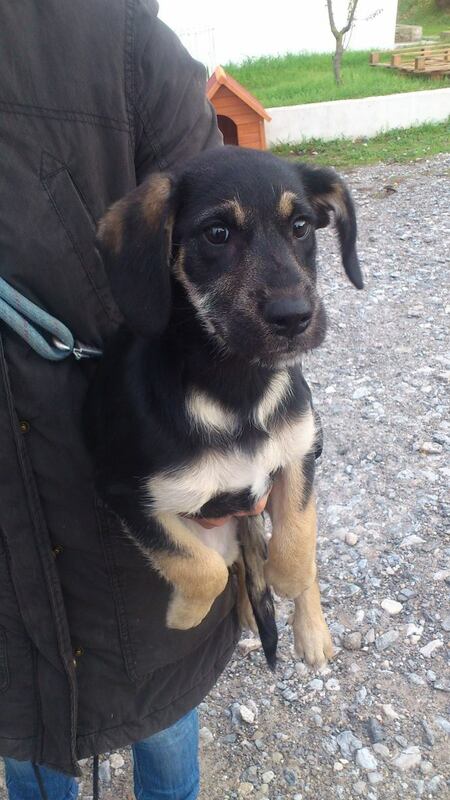 This little lad never made it to the refuge officially. His owners dumped him when he needed them most. He died at the vets. Hope the weekend’s activities help to raise my spirits a bit. 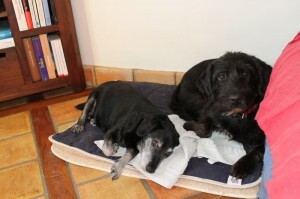 Today was the day of the long-awaited co-voiturage of three of our dogs, and all went smoothly, I am pleased to say. Things did not get off to an auspicious start, however, as the council were doing some tree pruning in my road and so I nearly didn’t leave home at all. Luckily my neighbour is a doctor and she pleaded our cause, saying that we both had lives to save today! I like her a LOT! 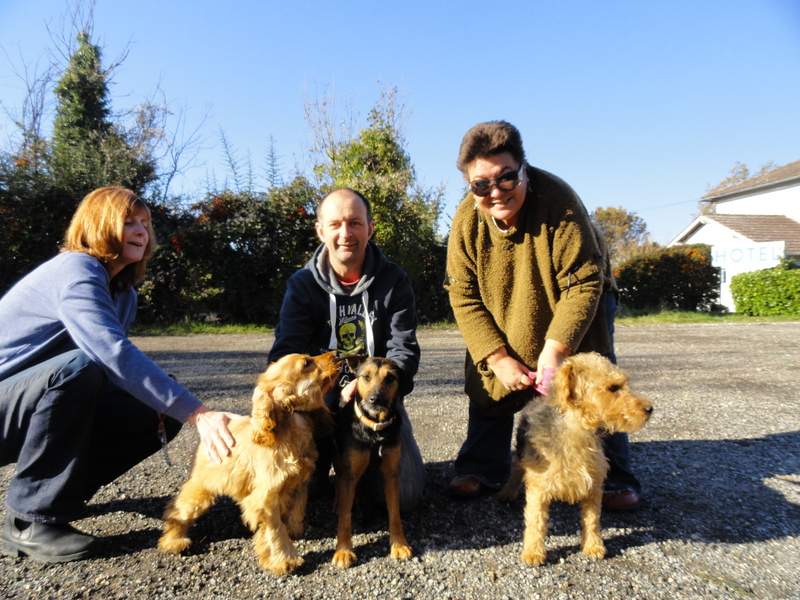 Val, who had been fostering Iola, and Debbie and Rob who had been looking after Jasper (ex Gafarot) showed up in good time at the SPA, and final hugs were given as they said good bye to their charges. I felt particularly sorry for Debbie who was very upset, but she and Rob have done an amazing job with Jasper and although it is always hard to say goodbye, you should be proud of what you have achieved with this little chap. I then met my co-pilot, Sharon and we went up to Toulouse to collect Coraline from her foster home with Lorena. Then it was up to Cahors, where we handed all three dogs over to Terry and Debbie two fabulous volunteers from Twilight. They had arranged meeting points with Iola and Jasper’s new owners before taking Coraline to Twilight. I am sure I will have news of them pretty soon, but for now I want to thank everyone for their various roles; especially Sharon whose GPS was the cause of much confusion, but whose sandwiches meant that all was immediately forgiven! Thanks to the three foster families, whose job is in many ways the hardest of all, and a huge thank you to Twilight for taking Coraline and for agreeing to take the two non-Twilighters further north. Terry and Debbie are real stars, as of course are Leeanne and Mike. 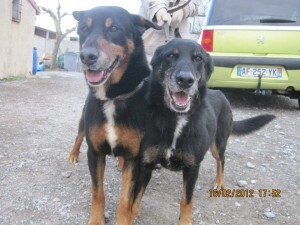 The families for both Iola and Jasper were found thanks to Doglinks, so thanks to them, too, as ever! Here is a wonderful video which shows you a bit about Twilight. Friday’s fundraiser in Puivert is to benefit both the SPA and Twilight, so please come along and support them and us too! There were four arrivals at the SPA, however, so today’s good news has been instantly negated. I am going to try to forget that and be happy for the three dogs who are in the warmth of their new families’ homes tonight. The moment of handover, with Debbie, Terry and Sharon. 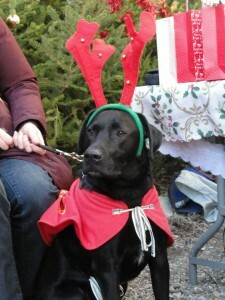 The gifts and kennels keep arriving; unfortunately so do the dogs! It is perhaps not coincidence that we always have dogs brought in to the SPA the day after every open day. People just assume that we will have lots of room thanks to all the adoptions. Well, guess what? Those days are long gone. 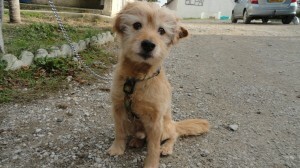 Yesterday one dog was adopted and today three arrived. I am no mathematical genius, but even I can work out what is happening. There are more and more dog at the refuge. Some of the older ones are surely destined to die there of old age. And at this rate the same is probably true of those who are young at present, but whose turn just never seems to come. And with people failing to sterilise their animals and giving away puppies on the internet and others encouraging them to do so, with the promise that they will home their unwanted puppies, things will only get worse. 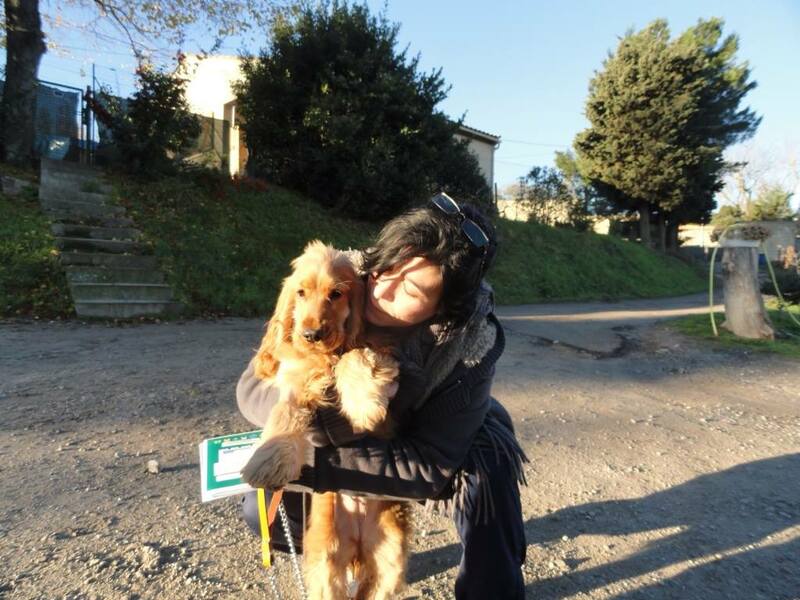 Volunteering (and indeed working) in a dog refuge has got to be one of the most masochistic past times on the planet. The strain of trying to look on the bright side and carry on doing our best to find homes for our animals when every step we take is negated by other people’s actions is soul-destroying. My mum used to say that it is like banging your head against a brick wall; it feels nice when you stop. But of course stopping is not that easy, when lives literally depend on us. Animal lovers show solidarity, of course, and today two new kennels were delivered, as well as packages of Christmas goodies for the dogs and cats. Thank you so much to the generous people who do their best to brighten the lives of our animals and keep them warm. Tonight as I see my four dogs curled up in their baskets I want to weep for the dogs at the refuge, many of whom will probably never know this comfort again. 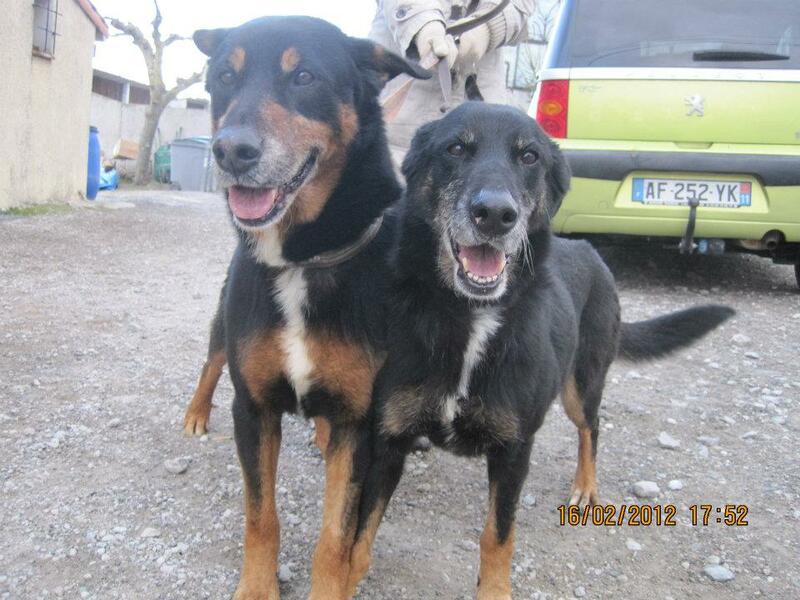 Ugo and Uta- Abandoned at age 8, in the SPA for over 2 years and probably destined to die there. Well, as many of you know, today, it being the first Sunday of the month, the SPA was open. And despite it not being our official Christmas for the Animals (which is the weekend of 14th and 15th December), it did feel a bit Christmassy today. There were gifts aplenty for both dogs and cats. Thank you all so much! Beds, blankets, treats, and food arrived throughout the afternoon, and so many dogs were walked that my camera was kept constantly busy. And the treats were not just destined for the animals, Jane brought along some flapjacks, which proved very popular with volunteers and visitors alike, despite initial worries that they would not taste good as they looked a bit “healthy”. We Brits know better! Thank you to everyone who came along to support us today. We had one reservation but more importantly an adoption. Inuit has been courting his eventual adopters for several weeks, and finally today he gave them no choice but to take him home! When he saw them approaching his kennel he howled (well, he is part husky!) and as ever, he was immaculately behaved on his walk. They decided to reserve him and left the refuge only to reappear five minutes later with the words “Why the heck not take him today”. So that is one more in the warm. None of us can take credit for this adoption; Inuit did all the work himself! 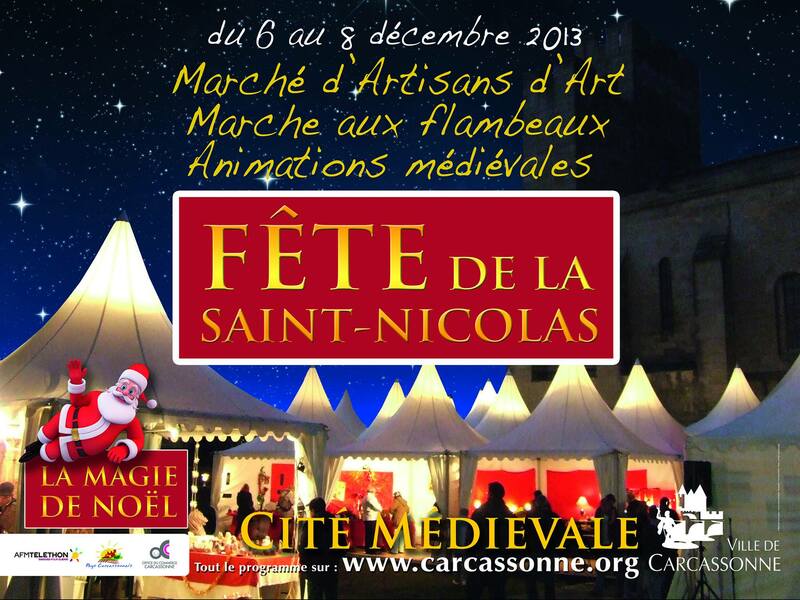 The volunteers made more plans for the Noel des Animaux in two weeks’ time, and we will also be present at the Magie de Noel at the Cite next weekend. Feel free to come and say hi to us and some of our dogs outside the theatre on both Saturday and Sunday afternoons! Rookie came to see us. He is 13 and a half and his mum makes great flapjacks! Inuit leaves with the family he adopted!